Abstract: The Spatial Media Group at the University of Aizu is exploring “mobile ambient” systems featuring individualized control of public display. 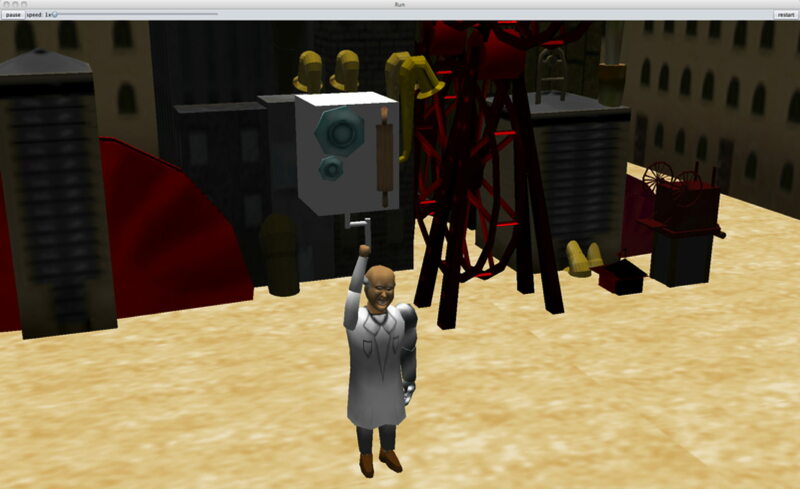 Augmented virtuality scenes have been rigged to accept realtime data from distributed mobile devices. For instance, magnetometer data from tablets, phablets, and smartphones can modulate aspects of the scene, including virtual affordances, objects, and camera position. 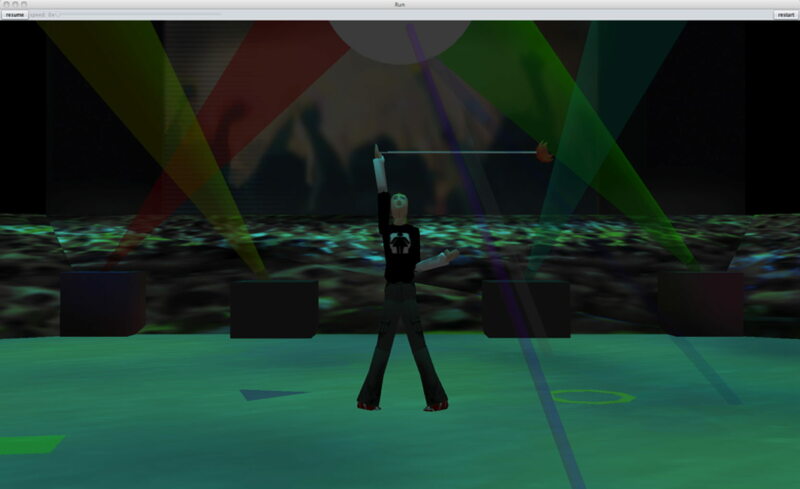 “Whole body” interfaces feature “poi”- and “padiddle”-style twirling. 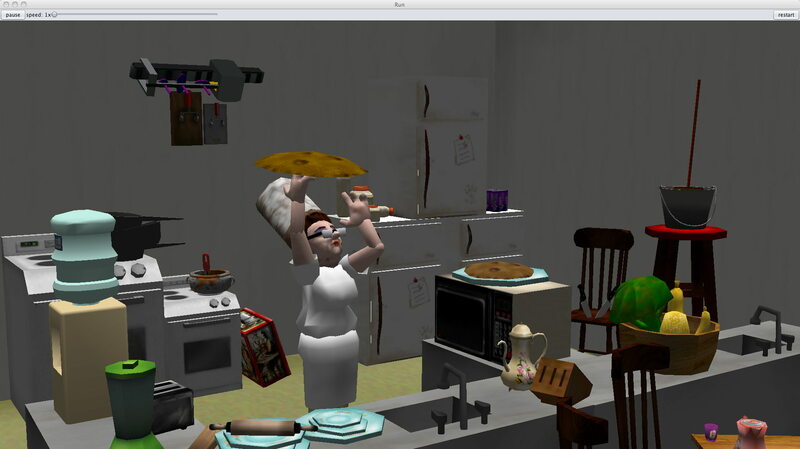 A unique feature of the augmented reality scenes is that the avatars are strategically ambidextrous and self-conscious, switching hands when the virtual camera moves around in a rotation & revolution phase-locked "inspection gesture," preserving intuitive alignment in both tethered and mirrored displayed projection modes. Michael Cohen. Integration of laptop sudden motion sensor as accelerometric control for virtual environments. In VRCAI: Proc. ACM SIGGRAPH Int. Conf. on Virtual-Reality Continuum and Its Applications in Industry, Singapore, December 2008. ISBN 978-1-60558-335-8. Michael Cohen, Rasika Ranaweera, Hayato Ito, Shun Endo, Sascha Holesch, and Julián Villegas. “Whirling interfaces: Smartphones & tablets as spinnable affordances.” In ICAT: Proc. Int. Conf. on Artificial Reality and Telexistence, page 155, Osaka, November 2011. Virtual Reality Society of Japan. www.ic-at.org/2011, ISSN 1345-1278. Michael Cohen, Rasika Ranaweera, Hayato Ito, Shun Endo, Sascha Holesch, & Julián Villegas. “"Twin Spin": Steering Karaoke (or anything else) with Smartphone Wands Deployable as Spinnable Affordances”, MC2R: SIGMOBILE Mobile Computing and Communications Review, October, 2012, 16(4):4--5. Michael Cohen, Rasika Ranaweera, Hayato Ito, Shun Endo, Sascha Holesch, and Julián Villegas. “Whirled worlds: Pointing and spinning smartphones and tablets to control multimodal augmented reality displays.” In HotMobile: Proc. Int. Wkshp. on Mobile Computing Systems and Applications, San Diego, February 2012, www.hotmobile.org/2012/. Rasika Ranaweera, Michael Cohen, and Shun Endo. “iBaton: Conducting Virtual Concerts Using Smartphones.” In Vitaly Klyuev and Alexander Vazhenin, editors, Proc. HCCE: Int. Conf. on Human-Centered Computer Environments, pages 178–183, Aizu-Wakamatsu, March 2012. http://sparth.u-aizu.ac.jp/hcce2012, ISBN 978-1-4503-1191-5, DOI 10.1145/2160749.2160786, http://dl.acm.org/citation.cfm?id=2160786. Michael Cohen. "PoI Poi: Point-of-Interest Poi for Multimedia Tethered Whirling.” In ACM SIGCHI MobileHCI: Proc. 9th Int. Conf. on Human Computer Interaction with Mobile Devices and Services, San Francisco, September 2012, <!- no longer up: www.mobilehci2012.org --> Honorable Mention, Demonstration Competition. Rasika Ranaweera; ラシィカ アミル ラナウィラ, Michael Cohen; 公園 マイケル, Kensuke Nishimura; 西村 健亮, Yuya Sasamoto；笹本 佑哉, Yukihiro Nishikawa; 西川 幸博, Tetunobu Ohashi; 大橋 哲恒, Ryo Kanno; 菅野 諒, Tomohiro Oyama; 小山 朋浩, Anzu Nakada; 中田 杏, and Julián Villegas; ジュリアン ヴィジェガス. Whirled Sequencing of Spatial Music. AES (Japan Section Conf. ): The Future of Multichannel Audio, Sendai, October, 2012. aes-japan.org/wordpress/?page_id=414. University of Aizu Spatial Media Group; Eyes, JAPAN; GClue. “Whirled Worlds”: mobile ambient twirling interface;「ワールドワールドズ」(回転する地球)： 360度パノラマ環境に近い携帯と固定／ルームウエアーイ ンタフェース 体全体を使ったエンターテイメント. Digital Content(s) Expo, Tokyo, October, 2012, www.dcexpo.jp/2012/. Michael Cohen. "Whirled Worlds": Mobile ambient interfaces for "practically panoramic" whole-body entertainment. Keynote Address, FCST: Int. Conf. on Frontier of Computer Science and Technology Suzhou, China, November, 2012. http://trust.csu.edu.cn/conference/fcst2012/. Michael Cohen, Rasika Ranaweera, Kensuke Nishimura, Yuya Sasamoto, Shun Endo, Tomohiro Oyama, Tetunobu Ohashi, Yukihiro Nishikawa, Ryo Kanno, Anzu Nakada, Julian Villegas, Yong Ping Chen, Sascha Holesch, Jun Yamadera, Hayato Ito, Yasuhiko Saito, and Akira Sasaki. “Tworlds”: Twirled Worlds for Multimodal 'Padiddle' Spinning & Tethered 'Poi' Whirling. Poster, SIGGRAPH, Anaheim, July, 2013. Michael Cohen, Rasika Ranaweera, Kensuke Nishimura, Yuya Sasamoto, Tomohiro Oyama, Tetunobu Ohashi, Anzu Nakada, Julián Villegas, Yong Ping Chen, Sascha Holesch, Jun Yamadera, Hayato Ito, Yasuhiko Saito, & Akira Sasaki. Twirled Affordances, Self-Conscious Avatars, & Inspection Gestures. Poster Demonstration. In Symp. on Mobile Graphics and Interactive Applications, Hong Kong, November 2013. Michael Cohen, Rasika Ranaweera, Kensuke Nishimura, Yuya Sasamoto, Tomohiro Oyama, Tetunobu Ohashi, Anzu Nakada, Julián Villegas, Yong Ping Chen, Sascha Holesch, Jun Yamadera, Hayato Ito, Yasuhiko Saito, & Akira Sasaki. Augmented Virtuality Twirling. Poster Demonstration. In Proc. ICAT: Int. Conf. on Artificial Reality and Telexistence, Tokyo, December 2013. Michael Cohen, Rasika Ranaweera, Bektur Ryskeldiev, Tomohiro Oyama, Aya Hashimoto, Naoki Tsukida, & Toshimune Miyaji. Mixed virtuality transducer: virtual camera relative location displayed as ambient light. Poster Demonstration. In SIGGRAPH Asia Symp. on Mobile Graphics and Interactive Applications, Shenzhen, China, December 2014. DOI 10.1145/2669062.2684185. Michael Cohen, Rasika Ranaweera, Bektur Ryskeldiev, Tomohiro Oyama, Aya Hashimoto, Naoki Tsukida, & Toshimune Miyaji. Multimodal mobile-ambient transmedial twirling with environmental lighting to complement fluid perspective with phase-perturbed affordance projection. Paper presentation. In SIGGRAPH Asia Symp. on Mobile Graphics and Interactive Applications, Shenzhen, China, December 2014. DOI 10.1145/2669062.2669080. Michael Cohen and Tomohiro Oyama. Exocentric Rendering of &lquo;Reality Distortion User Interface to Illustrate Egocentric Reprojection. In Proc. SUI: Symp. on Spatial User Interaction, https://www.youtube.com/watch?v=lC7cNSB1ZWE, Los Angeles, August 2015. Poster demonstration. DOI: 10.1145/2788940.2794357. Michael Cohen, Tomohiro Oyama, and Naoki Tsukida. Exocentric Visualization of “Reality Distortion” Interface to Interpret Egocentric Reprojection Perspective, by In: Proc. ICAT-EGVE: Int. Conf. on Artificial Reality and Telexistence and the Eurographics Symp. on Virtual Environments. Ed. by M. Imura, P. Figuroa, and B. Mohler. Demonstration. Kyoto, Oct. 2015. Bektur Ryskeldiev, Michael Cohen, and Julián Villegas. Rendering spatial audio through dynamically reconfigurable smartphone loudspeaker arrays, In: Proc. VRCAI: Int. Conf. on Virtual Reality Continuum and Its Applications in Industry. Poster. Kobe, Oct. 2015. Naoki Tsukida, Bektur Ryskeldiev, and Michael Cohen. “Lights, Camera, Action!”: ambient lighting extending photospherical display, In: Proc. VRCAI: Int. Conf. on Virtual Reality Continuum and Its Applications in Industry, Demonstration. Kobe, Oct. 2015. Michael Cohen, Yousuke Nagayama, and Bektur Ryskeldiev. Metering "Black Holes": Networking Stand-Alone Applications for Distributed Multimodal Synchronization, In: Proc. ICMI: ACM Int. Conf. on Multimodal Interaction. Tokyo, June 2016. DOI: 10.1145/2993148.2998530. Michael Cohen. Demo: Smartphone Rigging with GUI Control Emulation for Freeware Rapid Prototyping of Mixed Virtuality Scenes. In: MGIA: Proc. SIGGRAPH Asia Symp. on Mobile Graphics and Interactive Applications. Macao, Dec. 2016. isbn: 978-1-4503-4551-4/16/12. DOI: 10.1145/2999508.2999511. Michael Cohen, Rasika Ranaweera, Bektur Ryskeldiev, Tomohiro Oyama, and Aya Hashimoto. “Twhirleds“: Spun and whirled affordances controlling multimodal mobile-ambient environments with reality distortion and synchronized lighting to preserve intuitive alignment. In: ScPA: Scientific Phone Apps and Mobile Devices 3.5 (Sept. 2017). Ed. by David Philip Lane and Samuel Ken-En Gan, pp. 1–20. issn: 2364-4958. DOI: 10.1186/s41070-017-0017-x.